There’s something utterly charming about steakhouses set in historic mansions. 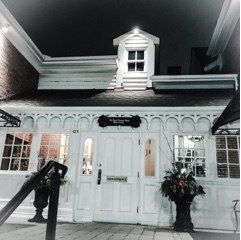 I’m not delusional, it doesn’t feel like I’m dining at an aristocrat’s home; the surroundings, despite the plush carpeting and baroque décor, is nonetheless still a restaurant. But, it feels like I’ve momentarily stepped back in time, when dinners last for hours and micro greens still don’t exist. 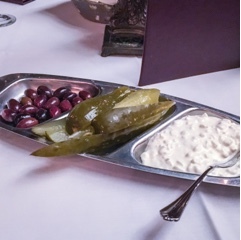 It may even be the strange complimentary starter that graces our table – the garlic bread and olives I understand… the salty soft pickles and cottage cheese? I have yet to comprehend their purpose. 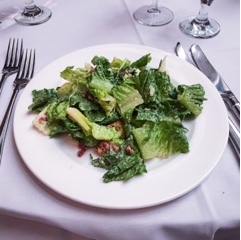 It’s a place where ordering salad is a treat – where a cart is wheeled over and the dressing is whizzed in front of our eyes. Two orders of Duncan’s table side Caesar salad for two ($25) was easily enough for our table of six. Our waiter working at lightning speed to combine the fresh egg yolk, vinegar, olive oil, Worcestershire sauce and anchovies. A hefty portion of garlic gave the salad a zing and the strong taste lingered until the next course was served. 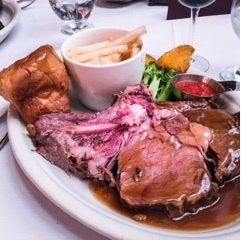 For myself, the Duncan's cut bone-in prime rib ($49) was beckoning – a thick slab of tender succulent meat coated in a salty barque crust. A hot pool of gravy covered well over half the plate and left the otherwise medium done meat cooked through. Duncan should consider offering the gravy on the side to stop the sauce from cooking the beef before presented. In true British fashion, a plump Yorkshire pudding adorned the plate, a buttery crust with a downright airy centre. The fries, although pale and limp looking, were hot and rich in potato flavours - they just needed a double fry to give it crunch and colour. The bone-in rib steak ($63) had beautiful grill marks, which added a lovely charcoal flavour that’d be hard to achieve even with a home BBQ. However, the beef itself was rather chewy for such a marbled cut … guess we’ve been too spoiled with the 30+ day aged meats. 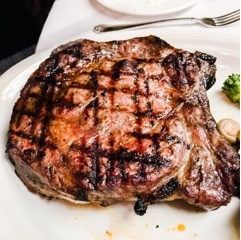 Although it doesn't appear large in the photo, the steak was huge and could be shared. It just so happened the baked potato was equally gargantuan. Perhaps the spoonful of listless looking mushrooms will provide a better sense of proportions. Take my advice – stick with the meat. Fellow diners had the cod and both were done beyond comprehension. A barque ring on steak is great… on fish, not so much. After so much meat, my husband and I couldn’t partake in desserts, but the menu consists of several classics that are enough for sharing. 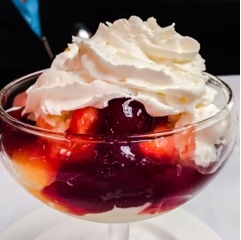 The Peach Melba ($7) looked tastier than the description – the simple vanilla ice cream elevated with fruit, strawberry sauce and whipped cream on top. 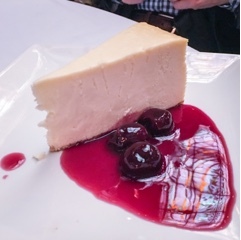 The New York Style cheesecake ($9) appeared dense and creamy, yet lacked the buttery graham crust that is my favourite part of the dessert. 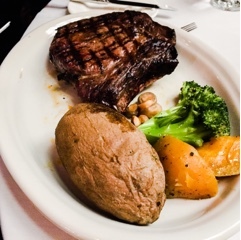 Something about the service makes old-fashioned steakhouses such a treat. There’s a level of efficiency and professionalism that’s admirable – our waiter ensuring we realized there’d be a wait for the salad given its popularity. Of course, they’re attentive but not intrusive; flitting about filling and clearing items without being known and knowing when to do it without asking. 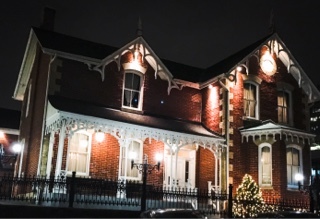 At David Duncan House, they may not have the wonderfully aged steaks, but their atmosphere is charming and worth a visit.